Try and spy the nocturnal carnivorous land snail around Heaphy Hut on a damp night. Get on your bike! Mountain bikes are allowed between 1 May and 30 November. Mountain biking is only allowed from 1 May - 30 November. You can start the track either from Brown Hut in Golden Bay (156 km from Nelson) or from Kohaihai on the West Coast (110 km from Westport). 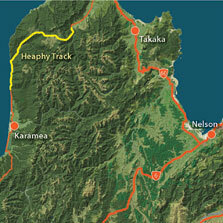 It's not a circuit track and is described here from Golden Bay to Kohaihai. About 180 m upstream from the hut, cross the bridge over the Brown River, then a grass flat, before winding up a well-defined track and into the bush. The track climbs gradually, following a route once surveyed for a road. After 4 hours, Aorere shelter is reached. From here, the Aorere Valley is seen extending northwards and on clear days it is possible to see Mt Taranaki/Egmont. Thirty minutes before Perry Saddle Hut, a short track leads to a viewpoint at Flanagans Corner. At 915 m, this is the highest point on the track. Perry Saddle Hut is 880 m above sea level. Near the hut in Gorge Creek is a deep but cold pool, popular for swimming. Cross Perry Saddle and sidle above Perry Creek through tussock clearings and patches of beech. Soon the valley widens and the track climbs a small rise to where the Gouland Downs, an open tussock area, is revealed stretching out to the west. The track meanders easily down to Cave Brook, passing the famed pole to which trampers have tied old boots over the years. Just beyond the brook is Gouland Downs Hut. Nearby, a small patch of beech grows on a limestone outcrop which has escaped erosion. This area is worth exploring. The track crosses one of several limestone arches, which are the remnants of old caves. Nearby, a small waterfall flows out of another cave passage. Beyond Gouland Downs Hut the track is relatively level as it crosses the northern part of Gouland Downs. The tussock country and riverbeds make for good exploring but, when the mist lowers, the featureless downs can be confusing and it is easy to become disorientated. Saxon Hut, nestled near the end of the downs, is named after John Saxon, who surveyed the track in 1886. From Saxon Hut the track drops slightly to grassy flats beside the Saxon River and then climbs gently up to a broad ridge, which joins Gouland Downs to Mackay Downs. A section on Mackay Downs floods in extremely wet conditions. This is a 70 m piece of the track across a wetland and a bridge. It becomes impassable and quite dangerous. Walkers should wait for the water to recede. The track now skirts the edge of Mackay Downs to James Mackay Hut, winding in and out of several small streams, just before they tumble off the downs and fall to the Heaphy River on the left. 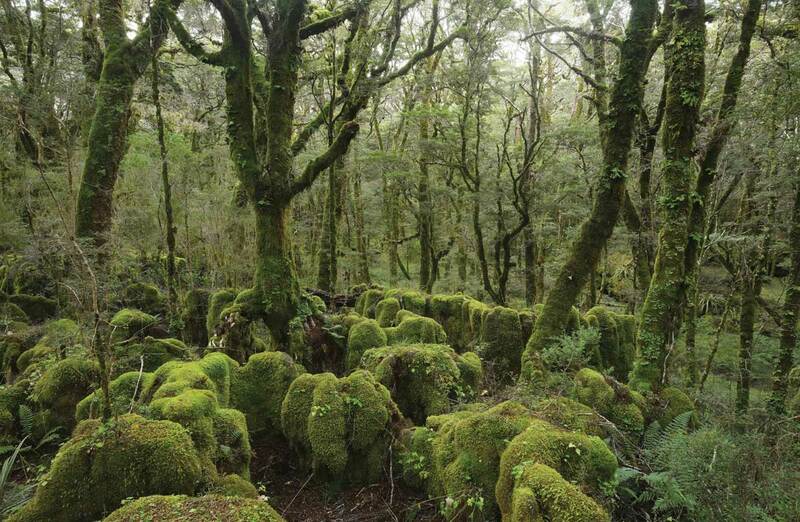 The vegetation is alternately tussock field and shrub-fringed patches of beech forest. Small creeks dissect the landscape and the pink granite sparkles and crunches beneath your feet. James Mackay Hut is situated just above the track on an open terrace. The Tasman Sea and Heaphy River mouth can be seen from here, 15 km to the west and 750 m below. It is named after the explorer who first pressed for a bridle track to be established between Collingwood and the West Coast. Beyond James Mackay Hut, a gradual descent to the Heaphy River begins. The track is through beech forest at first but soon the richer and taller forest typical of the West Coast becomes dominant. Occasional tantalising glimpses of the Heaphy River below are seen through the forest. The sounds of rushing water grow louder and suddenly the hut appears at the junction of the Heaphy River with the smaller Lewis River, along with sandflies and the first nikau palms. Charles Lewis was a Collingwood surveyor who, in the 1880s, was first to investigate Mackay’s proposed bridle route. 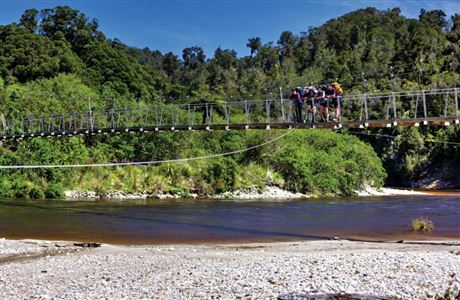 From Lewis Hut, head back up the track for a short distance and cross the Heaphy River, via the 148.4 metre suspended deck suspension bridge – the longest ever built by DOC. The track continues along the left bank to the river mouth through a forest of kahikatea, rimu and rata. Glossy-leaved shrubs perch precariously in the tall trees, flourishing in the abundant light and extracting nutrients from humus (accumulated plant debris) in their hosts’ branches. In dry spells, the sluggish river meanders along peacefully, but in times of heavy rain especially when it’s high tide, sections of the track and bridges get flooded. An area of limestone and karst locally known as Cave Stream about 15 min before Heaphy Hut, floods after periods of heavy rain. Extra care is required at both places in flood conditions and walkers should wait for the water to recede. Towards the river mouth, nikau palms become more common, the sea’s incessant roaring grows louder and, in some conditions, small waves can be seen running upriver. Heaphy Hut is situated far enough back from the sea to be spared the worst of the winds. The river mouth is at the junction of two pounamu (greenstone) trails and archaeological work has uncovered evidence of occupation by Maori that extends back 500 years. In 1905, an extensive European settlement was surveyed in the lower valley, but it was never built. Warning: It is dangerous to wade or swim at the mouth of the Heaphy River due to extreme tidal currents and rips. The Heaphy River mouth is an exciting place. The river surges out through a narrow gap into the sea - in-coming waves halt the flow and the churning of salt and fresh waters is spectacular. Just beyond Katipo Creek is Crayfish (Koura) Point. Crayfish Point no longer requires visitors to traverse the beach and plan around high tide. There is a high level track above the beach well away from the sea. The only risk that still faces people here is to take care crossing Crayfish Stream particularly after or during rainfall as it can flood quickly (and drops quickly). Soon Scotts Beach is reached - the clearing here is a good spot to rest before climbing over Kohaihai Saddle and down through wind-blasted shrubs to a bridge across the Kohaihai River. The track follows the riverbank for 400 m to Kohaihai carpark where there is a shelter and phone. The section of track around the Kohaihai River mouth may experience flooding issues when the river mouth becomes blocked. An alternative track has been put in place to allow visitors to bypass this area when this occurs. Warning: It is dangerous to wade or swim at the mouth of the Kohaihai River due to extreme tidal currents and rips. Fees are charged per person, per night to stay in huts and campsites on the Heaphy Track. 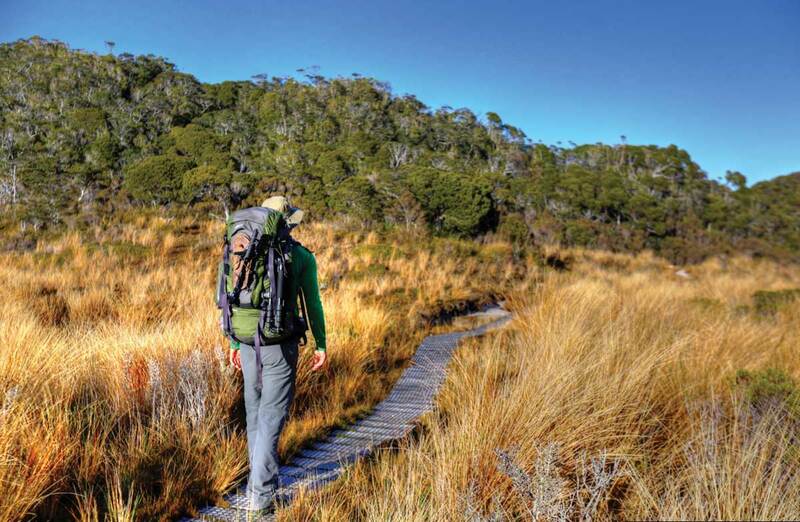 There are no fees to complete a day walk on the track or for entry into the Kahurangi National Park. Pay your fees by booking huts and/or campsites before you start the track. Fees are the same year round. See Getting there for transport options to the closest towns. 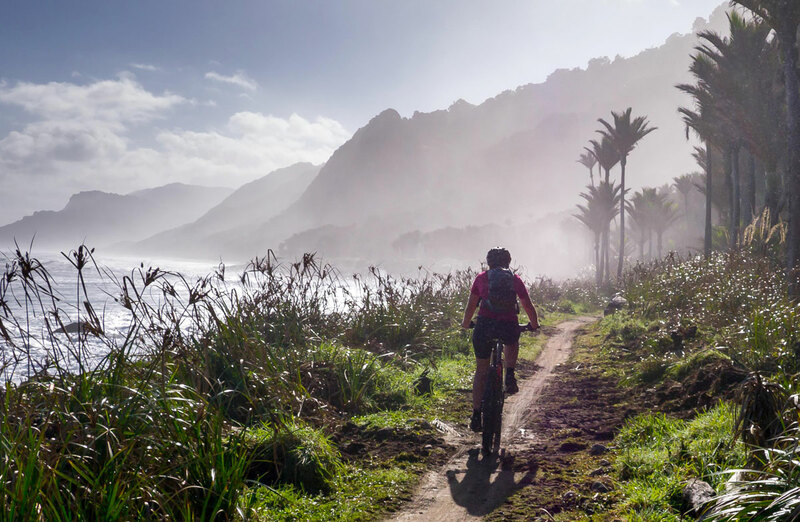 Decide what direction you want to walk or ride the track in – from Brown Hut in Golden Bay or Kohaihai on the West Coast. Air and shuttle services, and vehicle relocations are available for both ends. Note: Bookings are required for children and/or youth even though it's free for them to stay. The Heaphy Track is not a circuit track; the start/end of the track at Brown Hut in Golden Bay and Kohaihai on the West Coast are 463 km apart by road. Air services make it possible to walk the track one way and return by air to near your starting point. Air New Zealand flies into Nelson, the closest regional airport to the Brown Hut, and Sounds Air flies into Westport, the closest regional airport to Kohaihai. air transport services for Karamea (Karamea Information and Resource Centre website). Bus and taxi services are available to reach either end of the track from nearby towns. Both ends of the track have telephones; local calls for transport are free. Regular bus services link Nelson and Westport. Seek local knowledge, and plan the route you'll take and the amount of time you expect it to take. You can walk the Heaphy Track all year. The most popular period is during the summer from Christmas through to Easter, but walking the track in autumn can be good option - there are fewer people on the track and the weather is often calm and settled. 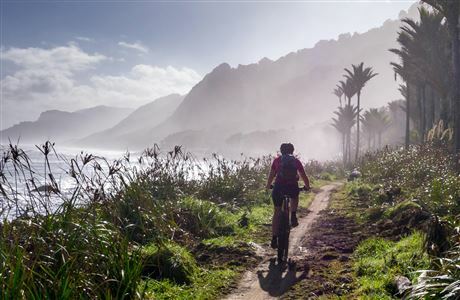 Mountain biking is only permitted on the Heaphy Track from 1 May to 30 November each year. There is a small risk of giardia, we recommend that you treat water before you use it. Major hazards are generally managed on the track during the summer (October to April) but not those hazards that are off track or on side tracks. 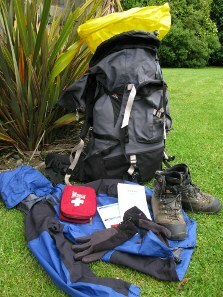 Transport, activity, equipment and accommodation businesses operate in the summer. Some businesses do not operate in winter. Huts and campsites must be booked all year round. See Fees and bookings. In summer (November to April) DOC rangers rotate among the huts, while in winter they are on the track or at the huts less frequently. Tell someone your plans and leave a date to raise the alarm if you haven't returned. The Outdoors Intentions process on the AdventureSmart website is endorsed by New Zealand's search and rescue agencies and provides three simple options to tell someone you trust the details about your trip. Fill in the visitor’s book if you are staying in a hut. In summer (October to April), one of our DOC rangers will be at each hut and is able to pass on information about the area or assist should an emergency arise. New Zealand's weather can be highly unpredictable. Check the forecast and expect weather changes. On the Heaphy Track the weather is changeable with annual rainfall averaging over 4000 mm. Heavy rain can occur with little warning and cause streams to flood - do not attempt to cross these when they are in flood. Be prepared for rain, snow and wind especially on the exposed sections of the track. 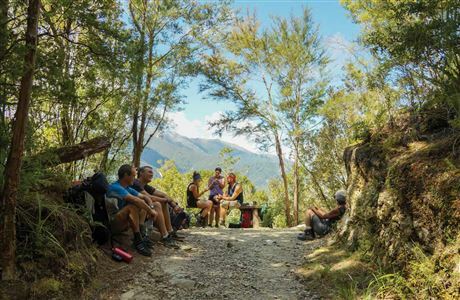 The Heaphy Track is classed as an easy tramping track suitable for walkers with moderate fitness and limited experience. The track is mostly well formed and some sections maybe steep, rough or muddy. It has signs, poles or markers and major stream and river crossings are bridged. You must be sufficient: make sure you have enough food, clothing, equipment and emergency rations for the worst-case scenario. Take an appropriate means of communication such as personal locator beacon. Food is not available for purchase at any of the huts. Generally cellphone coverage is poor and unreliable. At Aorere Shelter, on the beach near the Heaphy River mouth and along the coast track between the Heaphy Hut and Kohaihai Scotts Beach, coverage is usually available, although this depends on which telephone company you use. There are no rubbish facilities on the track.Trampers are reminded there is a pack-in pack-out policy for all rubbish. All rubbish must be removed. Visitors need to subtract 30 minutes from the Land Information New Zealand Westport Port tide timetables to get the correct tide times for the Heaphy Track coastline. When planning your trip, ensure you check the tide tables and allow adequate time in case of delays. 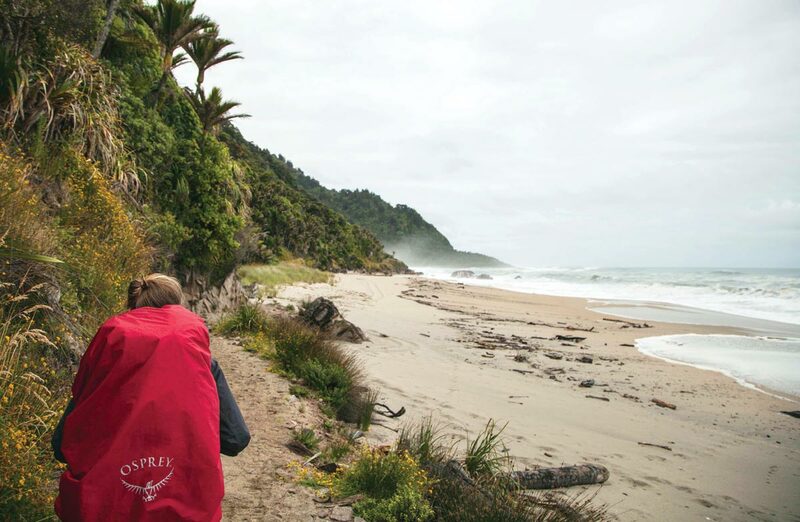 Sections of the coastal track between Kohaihai and Heaphy Hut may also be affected by rogue waves, large wave surges during high tides and rough seas which can cause the track to be temporarily impassable. Sections affected are clearly signposted. You must make your own safety assessment and be prepared to wait until the tide retreats as there are no alternative tracks available. 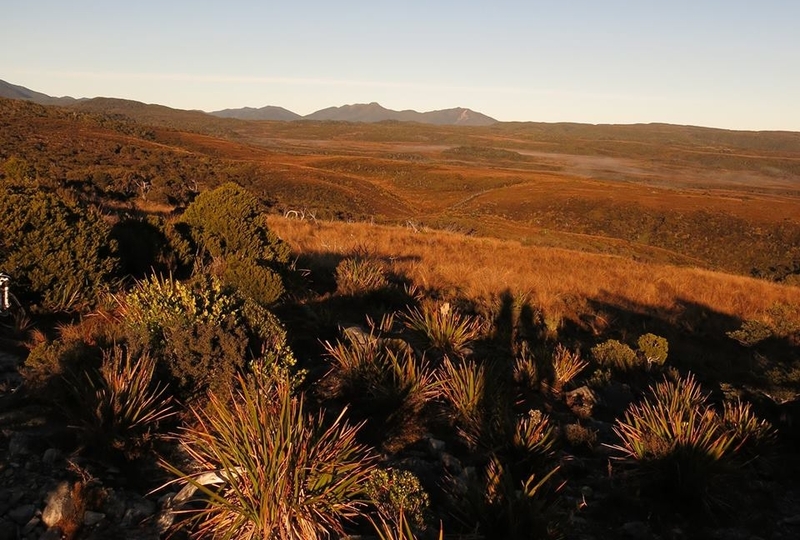 View DOC-approved businesses that provide guided options in Kahurangi National Park. The first section of the track climbs through a beautiful forest dominated by red and silver beech. Tiny orchids grow on the forest floor, many of them flowering in summer. At higher levels the trees are stunted and mountain beech appears near Perry Saddle. Beyond the saddle are the Gouland Downs, a remnant of an earlier New Zealand, eroded to a nearly flat surface known as a peneplain. At 500 million years, the rocks here are among New Zealand’s oldest. The rolling areas of red tussock with occasional patches of stunted silver beech are a spectacular sight, and somewhat eerie when the clouds lower. Flax, stunted shrubs and small herbs live among the sheltering tussocks. In boggy places, tiny sundews catch insects on sticky droplets, absorbing valuable nutrients from their quarry. Several plants found on the downs occur nowhere else, including a yellow-flowered lily and a small native foxglove. Beyond Gouland Downs, the track skirts the Mackay Downs through more tussock fields and patches of beech. The bedrock here is glistening pink granite with large black and white crystals of mica and quartz. From James Mackay Hut the track descends, passing initially through beech. 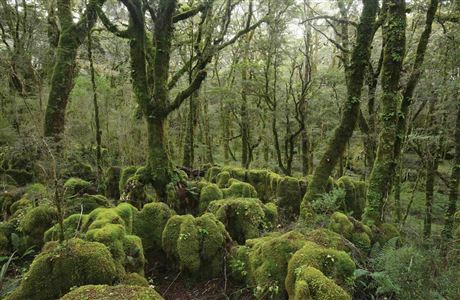 Below an altitude of about 300 metres, the forest changes and podocarps — the fleshy-fruited New Zealand “pine” trees — appear, often emerging high above their neighbours. The most common is rimu, but miro, kahikatea and matai will also be seen. Beech is no longer the main canopy species at this level. Other broad-leaved species, such as rata, mahoe, kamahi, pigeonwood, hinau, pokaka and pukatea, appear, adding diversity to the forest. Undergrowth is generally richer than at higher altitude too. Kiekie and supplejack twist their way upwards, while many small shrubs jostle for light near the forest floor. At the Lewis River junction the first nikau palms appear. The track continues through a bright and vine-festooned forest, following the naturally tannin-stained Heaphy River to its mouth. The final section of the track skirts the beach and has both a subtropical and a sub-Antarctic feel to it; while the forest is very lush with many large-leaved glossy plants and vines, the cold sea is far from inviting, running far up the beaches and pounding the rocky points. Tight clumps of wiry shrubs huddle together, their form testifying to the wind’s strength and direction. Weka, tui, bellbird, pigeon and robin are a few of the native birds which are readily seen. You may also see the large parrots - kea and kaka, the smaller parakeet and the blue duck. With luck and a bit more commitment it is possible to see, or at least hear, the great spotted kiwi. 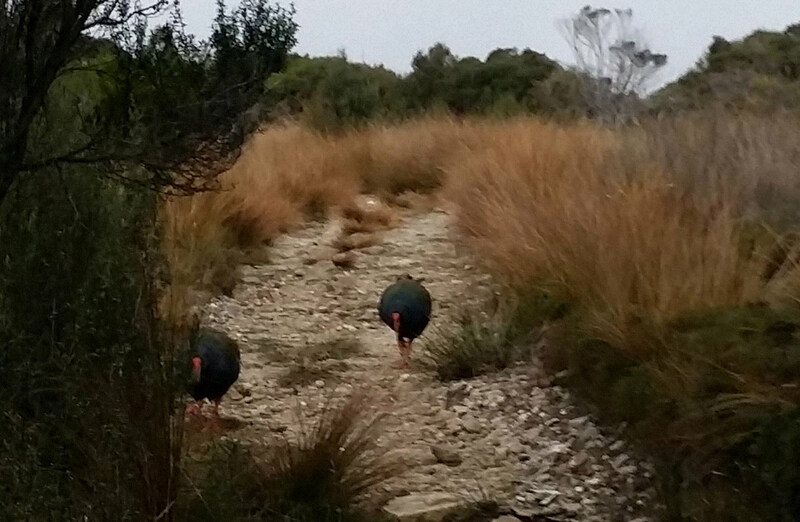 Gouland Downs could be the home to the first wild population of takahē outside of their Murchison Mountain refuge. Get more information. Long-tailed bats are seen more rarely coming out at dusk to feed in the open on insects. They locate their prey using echolocation, sending out sound pulses inaudible to humans, which bounce back off anything in their path. This bat and the rarer short-tailed bat were New Zealand’s only land mammals before the arrival of people. Both are now threatened by destruction of their habitat and introduced predators, such as rats and stoats. Any bat sightings should be reported to DOC. 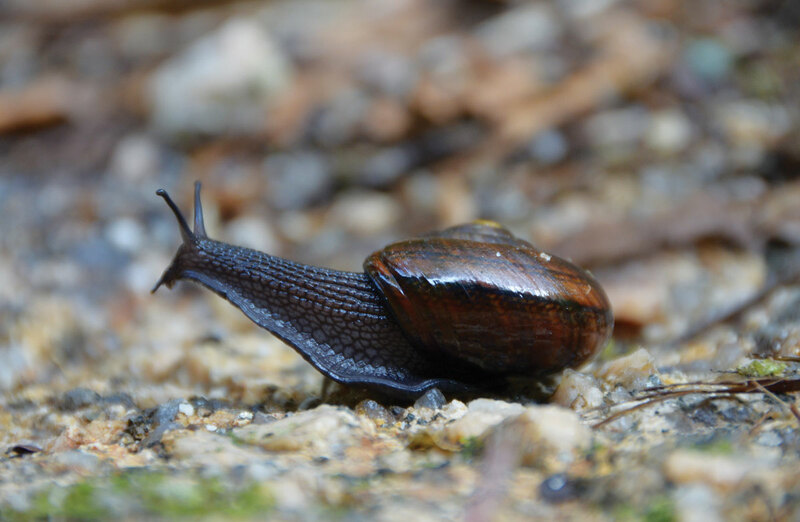 Kahurangi National Park harbours half of New Zealand’s 40 species of carnivorous land snail (Powelliphanta). Several may be seen along the track, particularly near limestone outcrops where there is enough calcium to nourish their sizeable shells. They shelter during the day and come out on damp nights to feed on native worms, which grow up to a metre long. A number of animals brought to New Zealand by European settlers have become established in the national park. Deer numbers are low, while pigs (which eat Powelliphanta), goats and hares have yet to spread to the west of the park in any numbers. Damage to forests near the track is minimal except on the West Coast, where the impact of possums on mature rata trees is becoming severe. Possums are also known to feed on Powelliphanta. All native wildlife in the park is protected. Taking live snails or their empty shells is prohibited. Kiwi surveys occur every five years at Gouland Downs and have now taken place three times. The good news for the great spotted kiwi is that this species appears to be holding its own. Kiwi numbers and population densities have remained much the same over the past 15 years. The recording of the presence of young kiwi is an encouraging sign that the population is renewing itself. Great spotted kiwi live within Kahurangi National Park in the area around Gouland Downs. You may hear the birds calling at night from the Perry Saddle, Gouland Downs and Saxon huts. Kiwi are most likely to be heard after dark. Male and female make different calls. Male great spotted kiwi make a shrill, repeated, drawn-out whistle “kiwi”. The female great spotted kiwi makes a harsh, low “churr”. Keep an eye out for kiwi feathers caught in vegetation along track edges, kiwi footprints in snow, probe holes where the birds have been digging with their powerful beaks in search of grubs and worms, and kiwi poo, which resembles extra large (up to 5cm) bird droppings. Before your trip, you can hear the noise of a female great spotted kiwi on the What Bird? website. Kiwi were once widespread throughout New Zealand in the time before Maori and Europeans arrived with their rats, dogs, cats, stoats and other mustelids. Kiwi evolved for thousands of years with little competition for the ground space of the forest. And back then there was plenty of forest! When mammals turned up, hunting with sound and smell, kiwi had no defences to deal with them. The result is that today all kiwi are classed as threatened species. In some area, kiwi are managed very intensively—eggs and chicks are removed to pest-free zones, raised and returned to the wild when strong enough to survive on their own. To date, Kahurangi’s great spotted kiwi do not need this kind of attention. Most Powelliphanta species occur in North-west Nelson and north Westland but, despite their diversity within Kahurangi National Park, you will be very lucky to see one alive. They are nocturnal creatures but occasionally venture out on a rainy day. 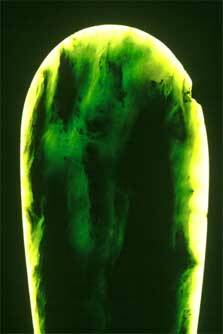 Their most active forays for food will be on warm, moist nights, especially those following a long, dry spell. It is more likely that you will come across snail shells but remember—collecting Powelliphanta shells is illegal. The largest species is Powelliphanta superba prouseorum, found in Kahurangi National Park and measuring about 90mm across. These are the Sumo wrestlers of the snail world, weighing in at 90 grams, or the equivalent of a female tui. Powelliphanta land snails are under serious threat. Habitat loss and predation are the main problems. As a result of major habitat loss in the past, many snail populations are now restricted to tiny pockets of native forest. If the forest is removed, opened up or dried out, many isolated populations could be gone forever. Domestic cattle, feral pigs, deer and goats trample the ground, which removes cover and causes drying—snails must have dampness. Possums, pigs and rats eat and crush the snails, as do weka, thrushes and hedgehogs. Possum control, rat control, weed control, revegetation programmes, habitat protection and wetland restoration are all conservation measures that are currently being carried out to give Powelliphanta a chance for survival. For many generations, Golden Bay Māori travelled to central Westland, where they sought pounamu (greenstone) for tools, weapons and ornaments. They followed a trail over Gouland Downs from the Aorere to the Whakapoai (Heaphy River) and also travelled the treacherous coast north of the Heaphy River mouth, risking wave-swept beaches and rounding huge bluffs using flax ladders. The track is named after Charles Heaphy. In 1846, while a draughtsman with the New Zealand Company, he and Thomas Brunner, a surveyor with the company, were the first Europeans to traverse the coastal portion of the modern track. At the time, they were on an exploratory trip along the west coast with a Māori guide, Kehu. The inland portion of the route remained uncrossed by Europeans for more than a decade after Heaphy’s coastal trek. A gold miner named Aldridge is believed to have traversed it first, in 1859, followed in 1860 by James Mackay, a warden on the Collingwood goldfields. Over the ensuring years the route was developed to a pack-track standard by prospectors, but by 1900 it was overgrown and infrequently used. With the 1965 establishment of the former North-west Nelson Forest Park, the track was cleared again for use by the public. Controversy arose in the early 1970s over a proposed road from Collingwood to the West Coast. The former New Zealand Forest Service improved the track facilities and now a route with a long tradition of use for commerce has a new life as a premier tourist attraction. 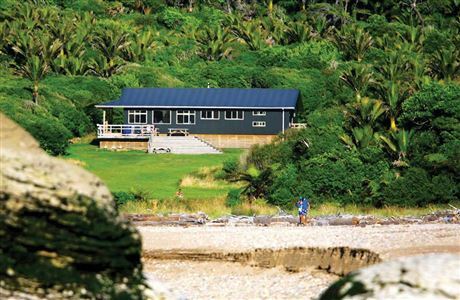 Trampers staying at Heaphy Hut are resting right next to one of New Zealand’s oldest and most interesting archaeological sites. The nearby bank of the Heaphy River was once a 13th to 14th century village, settled by people whose parents or grandparents could well have been born in Polynesia. As is typical of early sites in New Zealand, many types of stone sourced from throughout the country were used at the Heaphy for tool manufacturing; argillite from D'Urville Island, obsidian from Mayor Island (east coast of North Island), chert from central Otago, West Coast greenstone and Heaphyite. The abundance of stone from many sources adds weight to the idea that the first people in New Zealand explored the country quickly, readily discovering the best stone. “Sections of stone paving were found at the site during excavations in the 1960s, which is extremely rare for early New Zealand archaeological sites. This was however quite common in parts of Polynesia”, reports DOC Technical Support Officer Jackie Breen. The site was first excavated in 1961, which is just as well because two thirds of the original site has now eroded. A team from DOC, the University of Otago, the Historic Places Trust and Ngati Waewae is recording as much of the remaining site as possible before the river reclaims it.